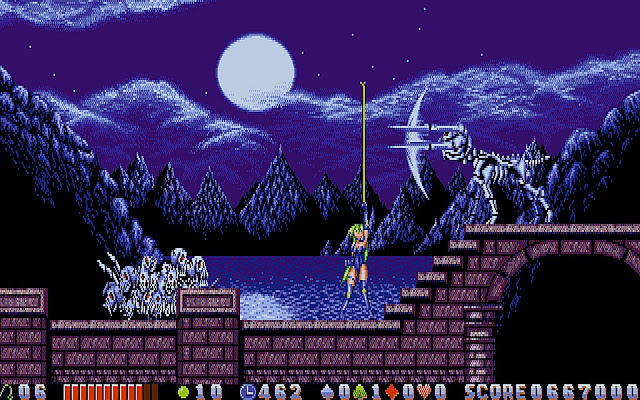 In 1993 C-Lab released the Castlevania style game ' Rusty ' for the NEC PC-9800 in Japan; An action side scrolling platformer that put you in control of the female whip-wielding vampire hunter character Rusty and sometimes her owl companion. She is on a quest to defeat a variety of evil monsters, the main villain Marquis Monte-Carlo and finally to find the missing girls in the cursed land of Transylvania. A game that was only ever released in Japan has now been given the once over by 46 OkuMen and is now in full English! If you loved playing Castlevania and you've never played Rusty, then you really should do so now. The production values of this game are really high with well designed stages, quality gameplay, and a soundtrack to match. The only downside of the game and one many have mentioned in the past, is just how similar some of the boss fights are to Konami's original game title. Although even with that said, the boss fights are pretty damn awesome, and this is a game you'll not want to miss. Links : 1) Source - Thanks VizionGamer!